Jared Leto and his band 30 Seconds to Mars will play Hollywood Casino Amphitheatre on July 9. 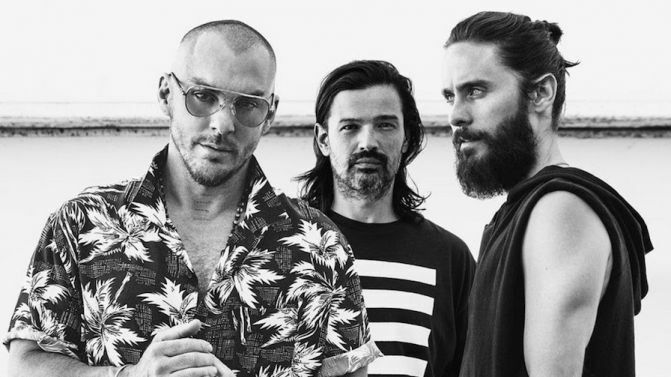 Tickets will go on sale on Friday, February 16 at 11 a.m.
Today, the multi-platinum selling band THIRTY SECONDS TO MARS announce their headline North American “The Monolith Tour”, promoted by Live Nation, kicking off June 6 in Toronto, ON. Jared Leto made the announcement today on The Ellen DeGeneres Show, giving each lucky member of the audience a ticket to an upcoming show. Walk The Moon, K.Flay, MisterWives, Joywave, and Welshly Arms will join as support on select dates. In addition, the group announces their highly-anticipated fifth studio album will be available April 6, 2018 via Interscope Records. The album is available for preorder now at http://smarturl.it/MARSpreorder. Each ticket purchase will include a copy of the new album. Tickets for the tour will go on sale to the general public starting Friday, February 16 at 10am local time at LiveNation.com. Citi® is the official presale credit card of “The Monolith Tour”.